OpenLuna | OpenLuna Foundation, Inc.
Audentes Fortuna Juvat : “fortune favors the bold"
Welcome and thank you for coming by to find out more about the OpenLuna project. We invite you to join (click here) the OpenLuna Foundation or donate (click here) to the project. Membership is normally $50 annually, but you can support our newly formed launch team at a promotional rate of $25. And the senior and student rates are available at the normal membership registration. Your support is greatly appreciated and will help take OpenLuna project where no opensource program has gone before. Mission 1 "Names in Space" has been combined with the launch team. 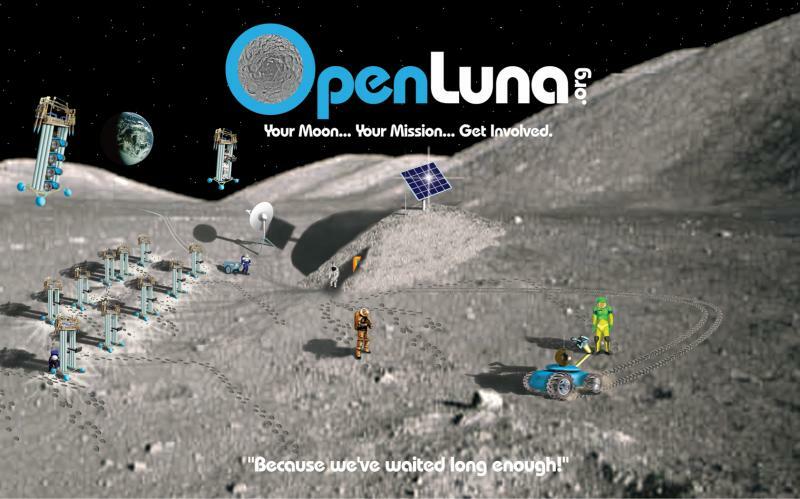 The OpenLuna Foundation's mission is to extend humanity’s reach into space. OpenLuna is embarking on a systematic program of robotic missions combined with extensive public relations, educational, and outreach campaigns. Following the robotic missions, a short series of crewed missions will take place, culminating in the construction of a six to ten person, self-sustaining outpost on the lunar surface. The outpost will be made available for public use. OpenLuna is part of the rapidly growing new-space industry; companies lead by innovative entrepreneurs and supported by technical staff inspired by NASA, fueled by the information age and communicating on the worldwide web. New-space is one of the few growing industries in the current economy. OpenLuna is a public outreach, privately funded (sponsors, members, entertainment revenue) program. Membership means having an active participation in this exciting industry for everyone. The program has varied membership levels to accommodate wide participation. If you can be a part of the next manned mission to space, why would you not? Click here to join. Our research and technology are open-source allowing/requiring widespread interest, enthusiam and involvement for the education and enrichment of all. Strong media presence is critical for furthering the educational potential of the mission and providing publicity for sponsors. Mission hardware will be light weight and geared toward continuity to reduce costs and increase reliability. Open source means that all scientific data gathered will be freely available. An educational public access website will be designed to compile data for training and to in-spire future generations to pursue STEAM sub-jects at all ages. Acceptance of outside research proposals and collaborative projects are encouraged. A 501(c)(3) privately funded organization with no dependency on government funds. OpenLuna Mission and other technical content by, and hosted on OpenLuna.org is licensed under a Creative Commons Attribution-NonCommercial-ShareAlike 3.0 Unported License.